"The Mask of Zorro" and "The Legend of Zorro" together in one Blu-Ray set! 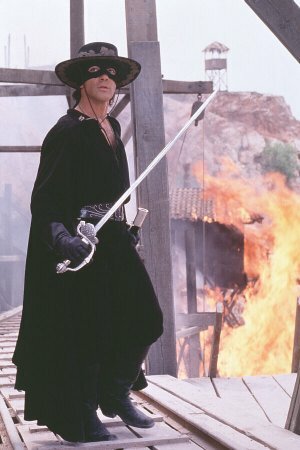 The Mask of Zorro (1998): First of all, the very character concept of Zorro is cool! He's like an Hispanic version of "The Lone Ranger". The black jumpsuit with hat, eye mask, and bullwhip makes for an impressive-looking hero. Not to mention his shiny black horse! The character of Zorro has been reworked so many times, though, that he has no definite origin. This movie creates their character of Zorro from scratch. Anthony Hopkins plays the original Zorro who, after being imprisoned for many years, trains a much younger man (played by Antonio Banderas) to be the new Zorro. Catherine Zeta-Jones plays Hopkins' daughter who was raised since infancy by the original Zorro's lifelong enemy. Both Zorros have a score to settle. The new Zorro avenges the death of his brother. One would think that this movie would be heavy drama for the dark mood it sets, but it is actually quite bright, optimistic, and full of action! Hopkins is at his very best here. It is also one of the best features Banderas or Zeta-Jones has ever been in.